One of the curious things that I noticed over the last year and a half at the University of Missouri–at least among the photojournalism students–was a rabid fascination with video from the Canon 5D Mark II. I was one of the first ones in the program to actually buy one (August Kryger beat me by about a week and a half) in December 2009. Other cameras sprang up that could do video, but people in the program seemed to wear blinders and were obsessed exclusively with 5D II video even though they did not even own a Canon camera or lens. I say that this is frustrating because I know from first-hand experience that the 5D and the 7D are both very frustrating to use as video cameras, even though the resulting video looks great. But for every second of good footage I’ve recorded, I’ve lost at least a minute of good material because of all of the physical limitations of using a dSLR for video: framing is a bit of a pain, autofocus is slow, setting up the exposure is also slow, daylight makes it hard to see the rear screen, and you can’t hand-hold it to save your life. Despite these flaws, I believe that Canon and Nikon have been overly effective at making people believe that they are the only game in town. Perhaps Olympus is a distant third. This culture of ignorance of anything that is not Nikon or Canon appears to persist among those who should know better. In May was invited by one of my professors to assist in a demonstration of some equipment in advance of making a final decision about purchasing gear for a new class that is under development. At the end of the meeting, when I asked if they had considered a Panasonic video camera instead of the Canon model they were looking at, I was told that considering Panasonic was like thinking about buying a Yugo. That was a slap in the face to me, but I was in no position to attempt to educate this person, nor do I think I would have been successful in changing their mind. The best kept secret from photojournalists? Anyone familiar with this blog knows that I am a fan of Micro Four-thirds in general, and the Panasonic G1 in particular. It’s small. It’s light. There’s no mirror, so it’s always in live view, and provides a live histogram; with its articulated LCD screen you can hold it up high, down low, from the side, and know exactly what your photo–and exposure–will look like. It’s Electronic Viewfinder (EVF) is astonishingly good: like looking through an optical viewfinder? No, not quite. But damn good just the same. The image quality, too, is impressive, but does suffer from the small sensor size when the ISO is ratcheted past 800. For some people I know, this is a deal-breaker, although I fail to see how. Perhaps that’s my background in chrome film talking, where 100 speed slide film was “fast” for me, and I shot Fuji Velvia and actually pulled its speed down to 40. 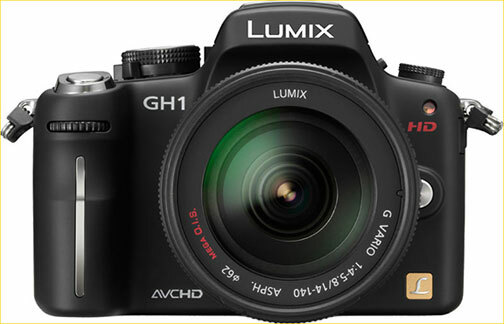 But I don’t want to take away from the main point, which is that the G1’s sibling, the Lumix GH1, is probably the video “DLSR” (it’s not really an SLR as it has no mirror, but you get the idea) of our time. What makes it such a good video camera? Because it has all the features I just praised of the G1: a fold out screen (how the hell do you hand-hold a 5D Mark II or a 7D without spending several hundreds of dollars on crazy accessories, including external LCD screens?! ), an electronic viewfinder so that you can hold it up to your head (again, hand-held video), the image stabilizers in the lenses are much quieter than Canon and Nikon’s IS, the autofocus is actually fast because, somehow, Panasonic figured out contrast-detect AF. The difference in autofocus between a Panasonic G1 and an Olympus PEN is night and day. For comparison, I don’t use the 5D Mark II for video unless it’s mounted on a tripod. You just can’t hand-hold it because it has to be several inches away from you in order to see its rear screen. Thanks to an active online community that loves that camera, it just got better. Michael Reichmann just reported of a new firmware hack for the GH1 which untangles its ability to shoot 1080/24P video from the strange 60i “wrapper” that the camera was originally designed to use. If I had the GH1, I’d be all over this. And I’m certainly thinking that the GH1’s successor–there has to be one in store–might very well be one of my next acquisitions given the options that video gives a storyteller over still photographs. It’s not just Canon and Nikon, folks!